In the English-speaking world, Jane Austen’s “Pride and Prejudice” continues to top lists of favorite books in reader surveys while film, stage, TV, and literary adaptations and sequels by multiple writers keep on coming. 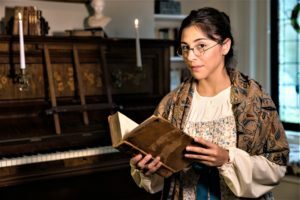 So, it’s not surprising that playwrights Lauren Gunderson and Margot Melcon’s 2016 play “Miss Bennet: Christmas at Pemberley” has quickly become one of the most produced new plays in the U.S. Described as a romantic comedy of manners that’s “both period and contemporary,” the action takes place two years after the end of the novel as the Bennet family and other related characters gather at Mr. and Mrs. Darcy’s fabulous estate for a Christmas celebration. 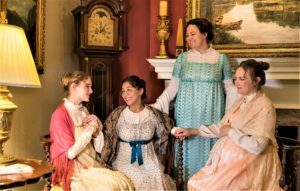 Elizabeth and Darcy are a happy couple, Jane and Bingley are expecting a child, and younger sister Lydia is coping with her husband’s frequent absences. But the play’s focus is on middle sister Mary, the nerdy one that did not get much attention in the novel. For those who can’t even remember her, she was the girl who loved books and played the piano – and did not get married. 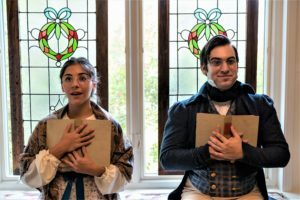 To help the cast master both the manners and the way of speaking of early 19th century England, the Classic asked New York-based coach Joe Goscinski to provide vocal coaching, while Elizabeth Ramirez, who serves as the show’s dramaturg, helped with appropriate body language and behavioral etiquette of the upper classes. And needless to say, lots of actors showed up to audition for the roles. Who wouldn’t want to be a Bennet sister?! quipped one auditioning actress, probably expressing a shared sentiment. The lucky ones who got the parts include Alyx Gonzales as Mary, Hunter Wulff as Arthur, Alison Chambers as Elizabeth and Nick Lawson who portrays Darcy. And I can’t wait to see it! Carolyn Dellinger as the Bennet sisters; Alyx Gonzales and Hunter Wulff as Mary and Arthur. Go see this production…exquisite! Although it is an extension of Austen’s original work there is joy and humor in every scene. Wonderful actors, humor, meaningful dialogue and beautiful costumes and stage setting. You will not be disappointed!